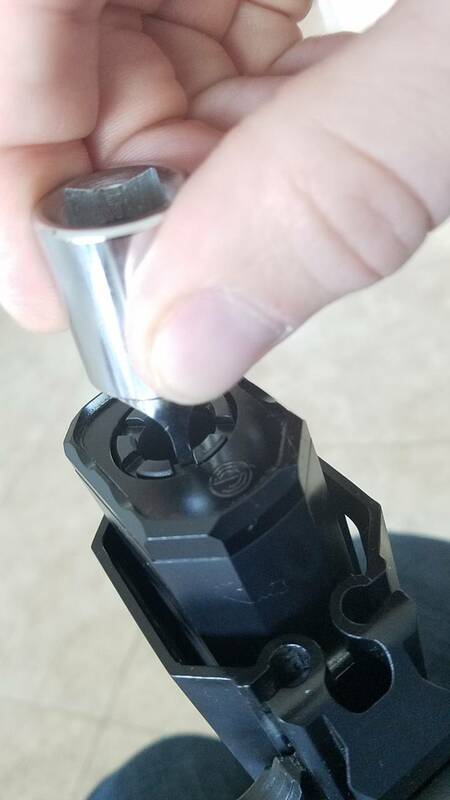 Response from CZ, "For the Scorpion Micro there is a castle nut that tightens and secures the faux suppressor onto the muzzle threads. There is a special tool that tightens this castle nut so we would recommend that you send the firearm in to us. However if you would like to have the tool yourself, you may be able to contact SilencerCo to see if they have any available for sale." I reached out to silencer co but am wondering if anyone has any suggestions for a tool I can use. Also, the castle nut loosened again during my second range trip. I just got my CZ Scorpion Micro about a week or so ago and have noticed that my faux suppressor has loosened up a little also. Mine hasn't gotten to the point where it rattles, but if you look at the end of the barrel it is obviously crooked in the hand guard opening. I managed to straighten the faux suppressor with my hand, but after the second trip to the range it's crooked again. I measured the castle nut and found it to be just over 3/4" diameter. I think I am going to purchase what they call a drag link socket to use to tighten it. You can find them made by various tool makers, but one of the easiest places is Amazon. They list several, but the one in the link below I think will fit the bill. The tool is probably a smart investment to make anyway because I'm sure that it would be wise to periodically remove the faux suppressor so that the barrel can be cleaned and oiled. Evidently this is going to be an ongoing problem with this suppressor wanna be. I'm thinking about adding a little blue loctite to the threads to prevent it from loosening again. Awesome brother, I just ordered it as I was having trouble deciding on a spanner socket that would fit right. Did you order the Drag Link socket? If so, curious if it is a perfect fit. Also, what about high-temp red loctite? I've used that on faux suppressors in the past that I didn't want coming off. When you want to get it off, a little direct heat from a micro torch and it should come right off. Thanks! Looks like that will work fine. It also might work to get a wider one as it will be thicker and then notch it so the width will fit. But I suppose if that one doesn't mark up the nut, it won't matter. Nice! Upload pics when you do that. I want to see how it looks with the handguard. Glad to see the drag link socket worked. Probably a better tool would be a 12 Ga. shotgun choke tube. A 12 Ga. shotgun has a .73" bore, so a shotgun choke tube removal tool should work. There are so many different styles of choke tube tools out there that it would probably be hard to find one that fits perfectly without being able to check it out in person, but it looks like the one in the link below would work. It has six lugs on it, so it should do a better job than the drag link socket and also have more gripping area. By having 6 six lugs on it, it should fit more securely and would probably prevent any accidental slippage. I would imagine that anyone who takes their faux suppressor off frequently might find something like this a better choice. Yeah something like that would be perfect if we figure out the right one. It would be nice if CZ or silencer co helped in that regard. 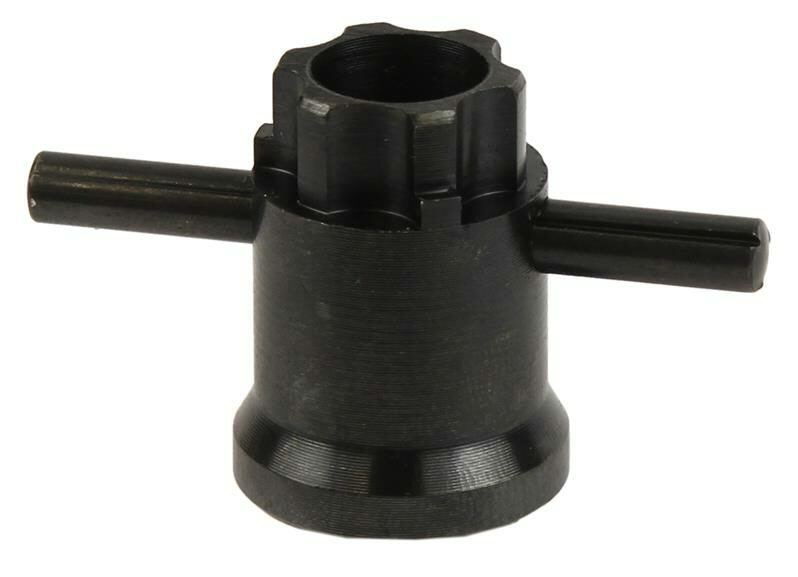 Note that the splines on the choke tube tool in the picture are tapered. They will need to be straight splines for the castle nut on the CZ. This doesn't mean that it is not the right idea, just that that socket would not be a good fit even if the right size was found. I tore mine down tonight, removing the Faux Suppressor "nut" slowly using a pair of horseshoe clip pliers. Since it was already loose it came off. I wanted to take the "nut" out to look for some sort of tool with out bringing the whole gun. I was hoping to find some sort of spanner socket or castle nut socket or something. I tried auto parts stores, Bass Pro and Home depot lastly. I was about to give up when I spotted a universal tool that normally I would not give a second thought to. It was less than 10 bucks and being retired Navy, I get a discount so I tried it. It's called a Gator Grip. If you hold it on the nut square, it will work. I wouldn't torque to hard though. Until the correct tool is available, I'll use this. Here are some photos of the Faux Suppressor removed. I'd call it more of a barrel shroud. I suspect as more of these micros enter the wild we will see more people with the issue. It certainly seems like finding a tool that fits this is becoming harder than it should. I contacted CZ-USA asking them to ask their gunsmiths what tool they recommend and if they can either sell one or give a parts number so that I could order one somewhere. They responded that they don't have a tool for that, but told me to contact SilencerCo. According to CZ, SilencerCo makes these for CZ and they should have a tool. That answer seems strange because from my understanding, the CZ Micro comes to CZ-USA in basically a kit form. CZ-USA installs the after market parts like the faux suppressor and the HBI hand guard and then sells the completed Micro to their distributors. In order to install the faux suppressor, they must have a tool. 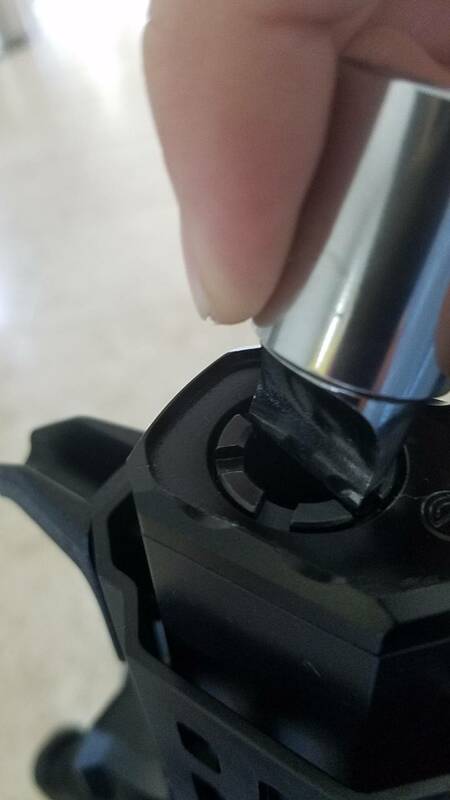 Evidently CZ-USA customer service doesn't know where to check for this. Multiple attempts to contact SilencerCo have failed. They have not answered multiple emails. So I guess the search continues. Yup they told me the same and I contacted Silencer Co who responded with "I am sorry, we exclusively make those faux suppressors for CZ, so we do not make a tool for them. I would recommend going through CZ to get this resolved."